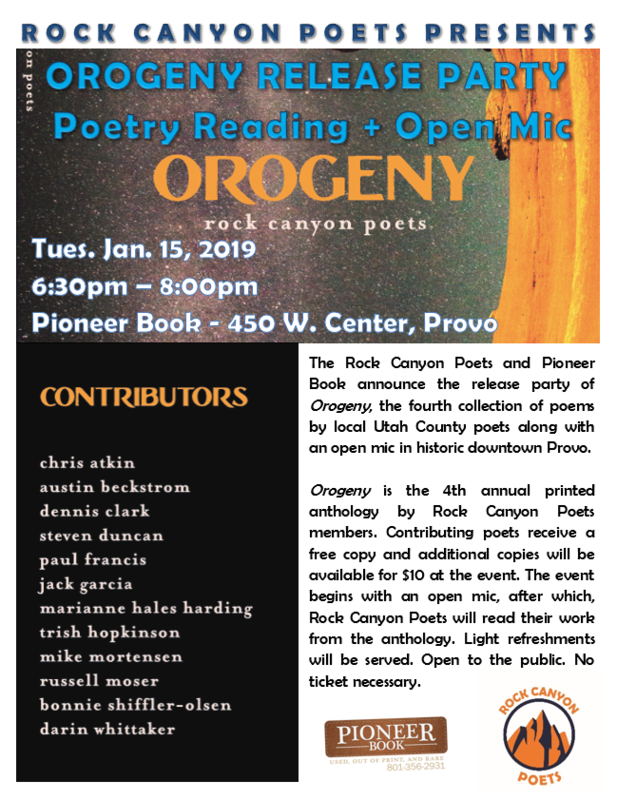 The Rock Canyon Poets and Pioneer Book announce the launch party of Orogeny, the third collection of poems by local Utah County poets along with an open mic on Tuesday, February 13, 2018 at 6:30 pm. 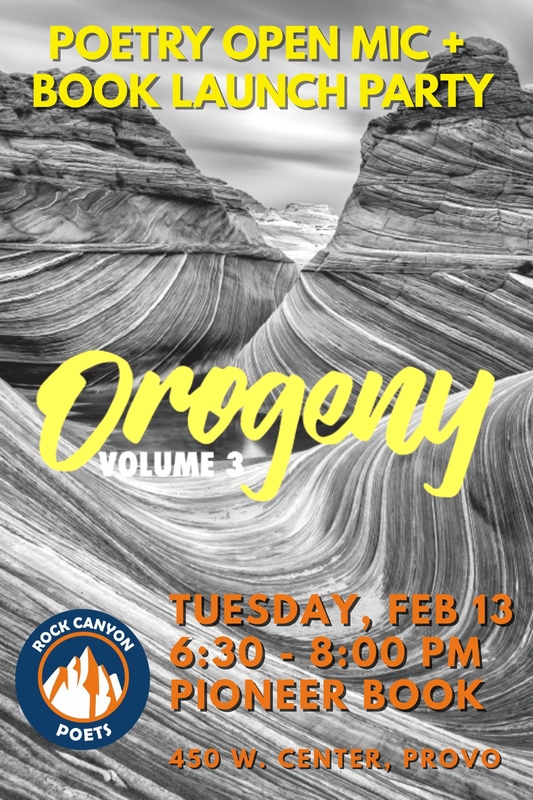 Orogeny is the third annual printed anthology by Rock Canyon Poets members. 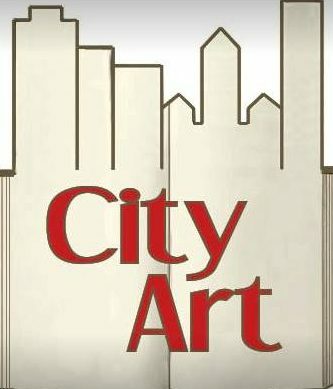 Each contributing poet receives a free copy and additional copies will be available to the public for $10 at the event. Poets will read their work from the anthology, after which, the open mic will begin and audience members are invited to read a poem they have written or a favorite by another poet. Light refreshments will be served. 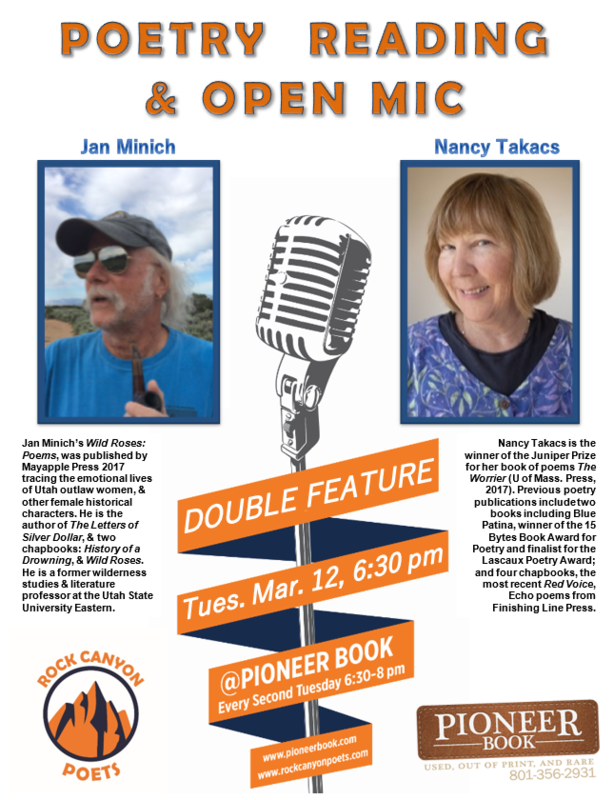 Rock Canyon Poets Inspired anthology release party and open mic was featured in SLUG Magazine’s special local literary issue! You can pick up your own print copy of December’s special issue across Utah at news stands. Special thanks to reporter Tyson Call and Kathy Zhou for covering our event and to our sponsors who made the workshops and poetry book possible: Pioneer Book and the Utah Humanities Council in conjunction with their Book Festival. Pick up your own copy of Inspired for just $5 and check out our first and second issues of Orogeny in our Poetry Store here. Don’t miss two incredible poets: C Dylan Bassett and Elizabeth Cranford Garcia! Both originally studied at BYU and are here visiting from California and Georgia respectively. Translator and poet, C Dylan Bassett is the author of The Invention of Monsters / Plays for the Theater and five chapbooks. His recent work is published in Black Warrior Review, Boaat, Ninth Letter, Washington Square and elsewhere. A graduate of the Iowa Writers’ Workshop, he currently lives in California and teaches Creative Writing at UC Santa Cruz. Elizabeth Cranford Garcia’s work has appeared in Boxcar Poetry Review, Poets and Artists, and Red River Review among others, as well as two anthologies, Fire in the Pasture: 21st Century Mormon Poets, and Stone, River, Sky: An Anthology of Georgia Poems. She currently serves as Poetry Editor for Segullah Literary Journal, and is a past editor of The Reach of Song, the anthology for the Georgia Poetry Society. Her first chapbook, Stunt Double, is now available through Finishing Line Press. She spends most of her time being mommy to two toddlers and keeping up with Walking Dead episodes with her husband in Acworth, Georgia. Bassett and Garcia visit Provo as guests of Rock Canyon Poets. The reading is open to the general public. 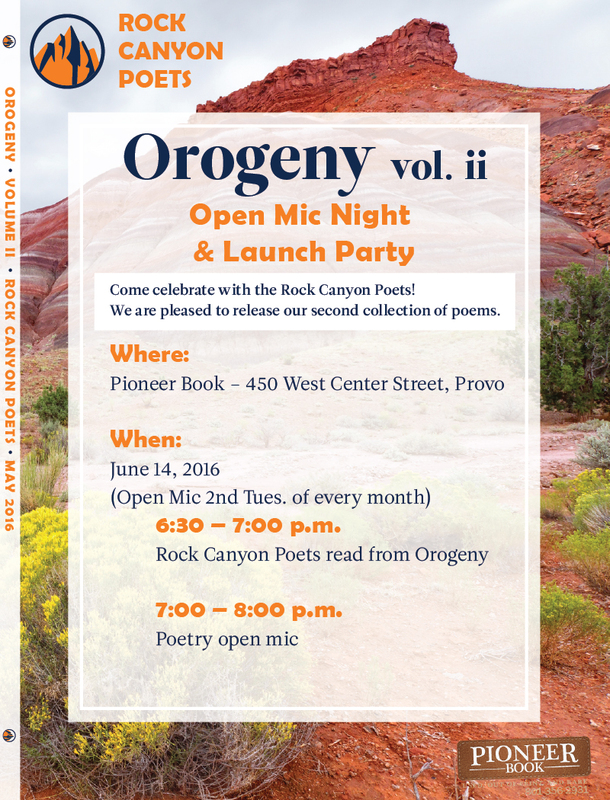 The Rock Canyon Poets and Pioneer Book announce the launch party of Orogeny, the second collection of poems by local Utah County poets along with an open mic on Tuesday, June 14, 2016 at 6:30 pm. Orogeny is the 2nd annual printed anthology by Rock Canyon Poets members. Each contributing poet receives a free copy and copies will be available to the public for $10 at the event. Poets will read their work from the anthology, after which, the open mic will begin and audience members are invited to read a poem they have written or a favorite by another poet. Light refreshments will be served.